If you’ve never experienced Amsterdam’s King’s Day (or “Koningsdag” in Dutch) – then you’re in for quite a surprise. 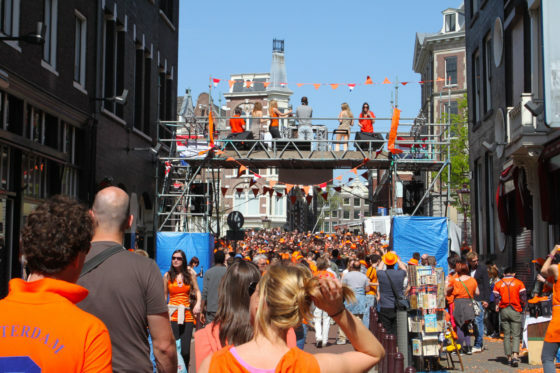 King’s Day could quite possibly be the biggest birthday party you will ever attend. This national holiday on April 27th celebrates King Willem-Alexander’s birthday – and all of Amsterdam joins in the festivities with dancing, live music, a citywide street market and a carnival-type atmosphere that takes hold over the entire city. 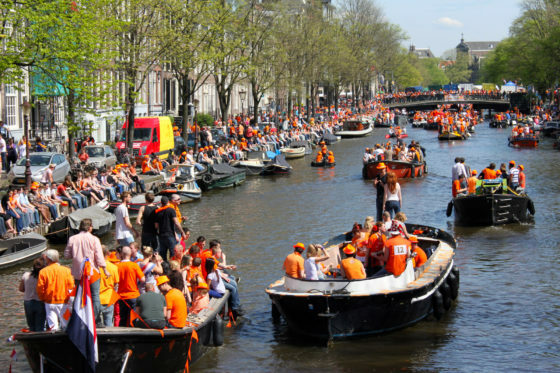 Boats create a traffic jam in the canals as everyone wears orange to celebrate King’s Day in Amsterdam. The many squares in Amsterdam are packed with people dancing during King’s Day in Amsterdam.